Climate Action Plans (CAPs) are fundamental for cities combating climate change. But what if there is conflict between neighboring cities’ methods to address the issue? What if these methods contradict, cancel each other out, or are simply not compatible with each other? Regional entities can help facilitate comprehensive solutions to these challenges. The following LGSEC Member Spotlight focuses on a regional CAP framework that offers best practices for developing, implementing, monitoring, and/or updating technical components of CAPs. San Diego Association of Governments (SANDAG) consists of 19 local governments and has created the Regional Climate Action Planning Framework (ReCAP). ReCAP is a technical framework for local Climate Action Plans (CAPs) to identify best practices and implementation strategies. ReCAP is a guidance document that provides the San Diego region with consistent planning methodologies, yet offers flexibility so that each jurisdiction can customize their CAP based on local circumstances. Provides information on how to develop GHG inventories, methods to estimate and project GHG emissions, and how to choose emissions reduction targets to include in a CAP. Describes California’s approach to GHG reduction and the relationship to CAP measures, the purpose and role of GHG reduction analysis, how to select CAP GHG reduction measures, methods to estimate GHG reduction from CAP measures, the visualization and presentation of results, and the emerging issues related to estimating GHG reductions. Provides an approach to Benefit-Cost analysis of the CAP by going over metrics, analyzation methods, data needs and assumption, how to present the results, and associated limitations. This appendix answers the questions, “What is the benefit or cost for each measure to reduce one metric ton of carbon dioxide equivalent?” and “What are the financial impacts to participants associated with each measure”? Reviews the process, methods, evaluation considerations, presentation strategies, and associated limitations of the implementation costs. Implementation cost analysis focuses on the internal costs and resources necessary for a local jurisdiction to implement a CAP. 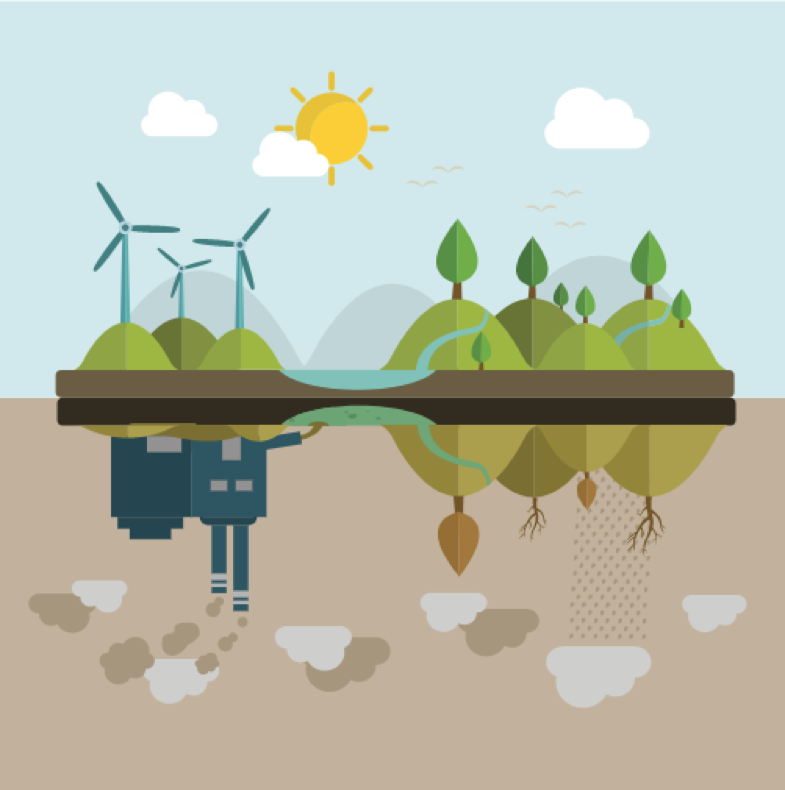 Provides an overview of the climate action planning process and how it relates to the California Environmental Quality Act (CEQA) by reviewing the the requirements for a “qualified” CAP and the accompanying CEQA documentation, project streamlining procedures, and legal considerations. The last appendix discusses CAP monitoring considerations and framework, the factors that can affect the CAP, and progress made in various cities. The ReCAP framework guides the Climate Action Planning Services that SANDAG provides to member agencies through its Energy Roadmap Program. 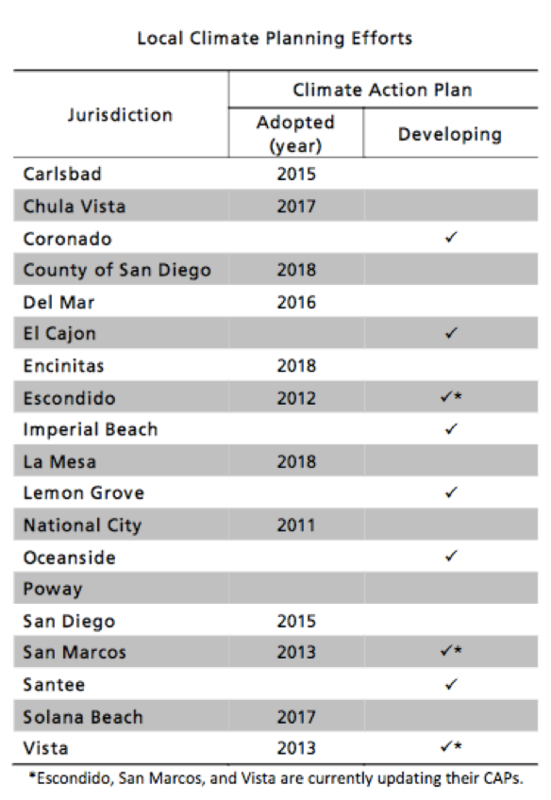 As of August 2018, 12 out of SANDAG’s 19 member agencies have adopted a CAP. 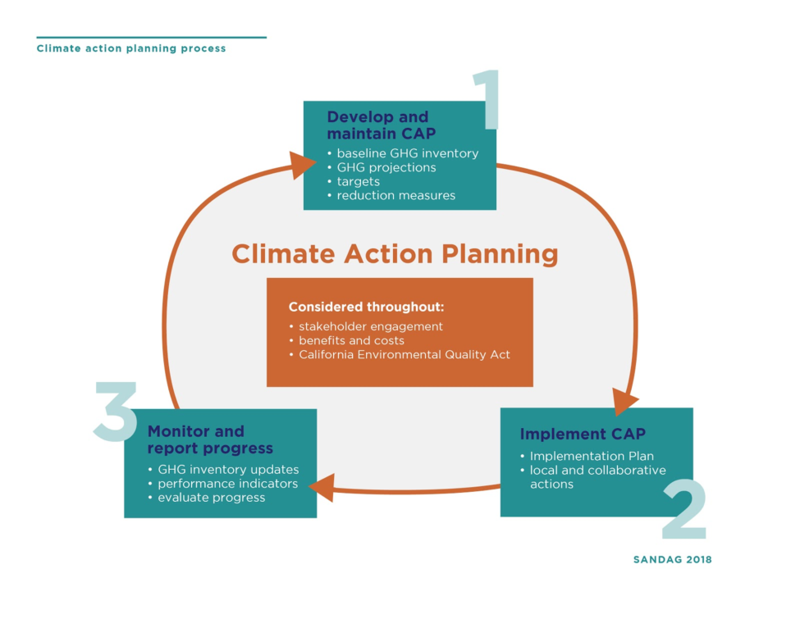 As CAPs are developed, updated, and implemented, the ReCAP framework is expected to continue to support local climate action planning efforts in the San Diego region. Since ReCAP is a component of the Energy Roadmap Program, funding is primarily provided by a Local Government Partnership with San Diego Gas & Electric (SDG&E) through California utility customers under the auspices of the California Public Utilities Commission. SANDAG leveraged internal funding to pay for non-energy components of ReCAP. SANDAG will be periodically providing updated GHG inventories and CAP monitoring reports for local jurisdictions through its Energy Roadmap Program. These documents will follow the methodologies developed in ReCAP and the ReCAP framework will be continually updated as new information and data becomes available. SANDAG worked in partnership with Energy Policy Initiatives Center at the University of San Diego and Ascent Environmental.